As our global civilisation moves closer to developing technology which can both transport and provide life support for humans across the vast distances required to get to Mars, missions such as Insight provide us with data and insights critical to understanding challenges. These missions provide crucial baseline science and cannot occur without extensive global co-operation and co-ordination between nations. Currently, as the number of missions in total is relatively small, however as the volume of missions increase, the number of technical and legal challenges will increase also. You only have to look at the explosion in the number of satellites orbiting Earth, to see that its possible for a space environment to become congested and contested in a relatively short period of time. There are 5 United Nations treaties on space include the 1957 Outer Space Treaty (http://www.unoosa.org/oosa/en/ourwork/spacelaw/treaties.html) and these provide a framework for peaceful operations in space and domestic legislative arrangements cover important financial, insurance and safety requirements and important country specific regulations and requirements for specific missions. As the number of missions to the Moon, Mars and other places in our solar system increases; its important to examine the questions of how to ensure that international frameworks continue to promote peaceful operations and allow equitable access for all nations to sites which are identified as significant or important. How do we avoid creating a system of regulation which is cumbersome and expensive, does not stifle technology development and promotes safety? Easy, if every Space related organisation from Space Agencies to Commercial business added a Lawyer/Scientist to their team, this will bridge the gap between technology and law, and identify areas of potential issues. InSight is different to previous Mars missions. It is not a rover or an orbiter. It is a geophysical station to be placed on the surface with passive instruments that will sense the interior structure. The aim is to understand how Mars has formed, how it differentiated and how much is it different to our planet. Ultimately, this will contribute to the knowledge of how all rocky planets formed. My role is to study marsquakes that originate from meteoroid strikes on the ground and fireballs bursting in atmosphere. I make numerical simulations of impact events, and this is my contribution to the large InSight team of scientists and engineers. I work with my two PhD students on Mars InSight project at the newly formed Space Science and Technology Centre at Curtin University, the largest planetary group in Australia (and the Southern hemisphere). Space mission launch and landing are two nail-biting moments, as these manoeuvres are technically challenging, but NASA has been landing missions successfully for a long time, so I hope this one won’t be any different. In case of a lost mission, all these years put into design, building and launching as well as all science preparations behind the mission would not be in vain. We learn from our experiences and if InSight is not meant to be, we will keep working towards new endeavours in discovering Mars. We live in an amazing time to be working in space exploration. With active involvement by space agencies around the world as well as this new momentum coming from private industries, the space sector is only going to grow. You probably know that Australia has its own space agency now, which makes it an awesome time to be advancing the space sector nationally as well. You might imagine that a world without a dynamic crust of shifting tectonic plates would never have earthquakes. After all, that’s the main reason we have quakes on our own planet, as the plates slowly rub together, slide under each other, or pull apart. As far as we can tell, though, the planet Mars has an unbroken crust without moving plates – but we believe it will still have marsquakes. How would they be caused? Meteorite impacts, for a start, since Mars’ thin atmosphere burns up far fewer incoming space rocks than the Earth’s does. And shrinkage of Mars’ crust, or swelling of the underlying soft rock due to convection in its interior could also cause marsquakes. Potentially, such quakes could tell us an awful lot about the interior of the planet, as they do here on Earth. But so far, we’ve had no way of detecting them. Enter InSight, the brilliant new NASA Mars lander, which is expected to touch down early on 27 November. With a seismometer to die for, placed directly on the Martian surface, plus other sophisticated instrumentation, InSight will tell us much about the planet’s interior over the next couple of years. Mars InSight is a lander rather than a rover. That means it does not have wheels to move around and it will be located in one place for the duration of the mission. Landers are generally cheaper than rovers because they have less movable parts to break down, but it is the mission objective that has driving the design of Mars InSIght mission. The lander carries a sensor for listening the “heartbeat” of Mars, which is tectonic activity of Mars. This will help us understand better what is Martian core made of, which then also tells us more about how terrestrial (rocky) planets form in general. Another important mission objective is to measure the inner temperature of Mars, using the heat probe that will dig 5 meters deep through Martian regolith. While we know plenty about the surface temperature of Mars, we need to dig deep to measure the residual temperature from the time of planetary formation to see how much of that heat remains still trapped insight. All these data will also help us to understand better what influences habitability (a potential to host life) of rocky planets and whether Mars could still host active life forms, rather than just fossilised life. Associate Professor Michael Brown is an astronomer at Monash University's School of Physics and Astronomy. Mars InSight is the first lander devoted to understanding the interior of Mars. Whereas Martian rovers have shown us how similar Mars is to Earth, Mars InSight will explore key differences. Why is Mars so geologically quiet while the Earth has plate tectonics, active volcanoes and violent earthquakes? Mars may have lost its magnetic field due to geological inactivity, and this may have resulted in Mars losing most of its atmosphere and water. Mars InSight will look under the surface by measuring the heat flowing from Mars’ interior. It will also use a seismometer and marsquakes (including those caused by meteorite impacts) to probe the interior, using the same techniques geologists have used to understand the interior of the Earth. Landing on Mars is high-risk. More than half the landing missions since the 1960s have failed to reach the surface, or have not been able to return data when they did. Apart from the rover Curiosity (it’s still not clear if Opportunity is going to fully recover from recent dust storms), there are no instruments actively gathering information on the Martian surface right now. Given that many hold out hope that settlement on Mars will make humans a ‘multiplanet species’, we really need to have a better understanding of what makes the planet tick. If Mars InSight is successful, it will use its robot arm to place a small seismometer onto the surface. And then – the lander will wait still and silent, hoping to pick up the tell-tale signals of rocks cracking and moving below the surface, sending waves of vibrations bouncing through the deep layers of the planet that we know so little about. This is the first time that that we’ll have such direct measurements of the mysterious interior, so it’s a very exciting mission. The InSight mission will allow us to peer beneath the immediate surface of Mars for the first time. This will allow us to better understand how it was formed, and its present condition. Just like you can tell a hard-boiled from a raw egg by how it spins, the RISE instrument will allow us to determine the internal structure of Mars by tracking how it rotates. Landing on the Red Planet is hard. Almost as many missions to Mars have failed as have succeeded. After a 484 million km journey InSight must hit a window just 10 x 24 km across in the atmosphere, otherwise it risks burning up or bouncing off the atmosphere. Hitting this target window is like threading the eye of a needle from a distance of over 20km. A successful landing on Mars after the 7 minutes of terror that includes supersonic airbrakes, parachutes and retro-thrusters firing, will be the first NASA mission to the surface in nearly a decade and is a big deal! The site chosen Elysium Planitia is the most boring on the planet, which is great! A featureless, flat location means less risk of tipping the lander on rocks or not being able to deploy solar panels on the slopes. The InSight lander will explore the inner structure of the planet over two years. Seismographs will measure seismic waves as the planet cools and shrinks as well as asteroids crashing into Mars all setting off ‘Marsquakes’ that move faster in denser solid cores than liquid mantles of rocky worlds, a technique used to probe the Earth’s structure and an advancement in our knowledge. One of the most ambitious science efforts will be drilling 15ft (or 5m) into Mars by the ‘mole’, that will jackhammer itself and accompanying thermometers into the rock to record the temperature and rate of cooling of the Red Planet giving us clues as to why Mars has ended up so different to Earth. Managed on NASA’s behalf by the CSIRO, the Canberra Deep Space Communication Complex (CDSCC) has been providing vital two-way contact for the InSight mission since its launch from Earth in May this year. The facilities giant antenna dishes sends commands and receive data from dozens of robotic spacecraft exploring the solar system and beyond, including eight missions currently operating at Mars. 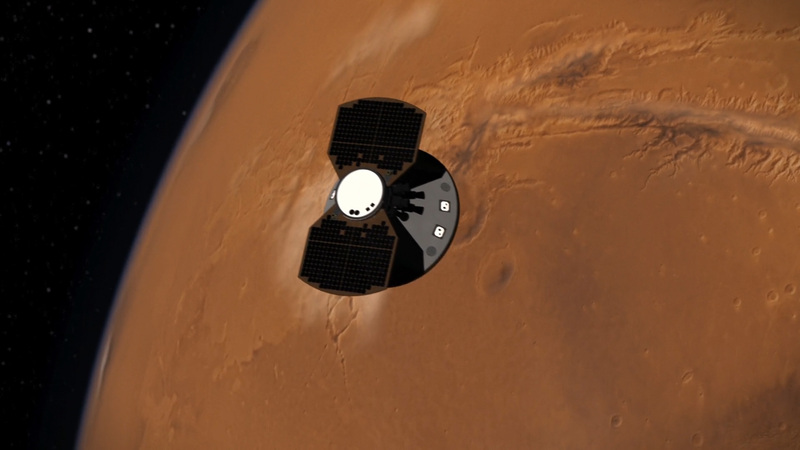 Before it makes its final preparations to land on Mars early Tuesday morning (AEDT), CDSCC will have contact with InSight to relay any last minute course corrections or uplink any changes to the spacecraft’s landing instructions. Along with our two sister stations in Spain and the United States, Canberra will be supporting InSight as it begins its mission on the red planet. We are the only places in the world capable of communicating with these spacecraft at such enormous distances. InSight will give scientists a greater understanding of the formation and early evolution of planetary formation, including Earth. Travelling with InSight are two briefcase-sized cubesats called MarCo, the first test of an interplanetary internet that will help relay news of InSight’s landing back to Earth. Everything is ready in Canberra to receive InSight’s call. I’m really excited about this new mission to Mars - it’s always great when we see a new spacecraft landing on the Red Planet, but InSight is particularly interesting, for me, because it is going to be doing something totally new. By studying Mars Quakes, the spacecraft will tell us a great deal about Mars’ interior - offering our first real insights into how seismically active the Red Planet is. It will also detect the impacts of asteroids and comets on the Martian surface, by recording their seismic signatures (the ringing of the bell after the planet is struck, essentially). As someone who’s interested in the impact rates of asteroids and comets in the Solar system, this will be fascinating information, letting us get a feel for just how often Mars gets hit. I also love the idea of the heat probe InSight will deploy - sending a robotic mole to drill five metres down beneath the surface, to measure how much heat is leaking out from the planet’s interior. Put together with the seismic studies, this will help us understand whether Mars is a dead world, or whether it is still hot enough in its interior to drive that kind of activity. It’s a really exciting mission, and I’ll be watching for confirmation that the landing went smoothly with bated breath! NASA’s Insight mission is a wonderful science initiative to learn more about planet formation processes, including aspects that relate to the understanding of how Earth’s history formed. By measuring current tectonic activity on Mars, a much smaller planet than Earth and one that has largely cooled, we can learn about how Earth formed within the solar system, and also about what the long-term future of our planet will be.